Rotary Valves optimize material throughput per rotation. Due to housing barrel size, CDC-CI Series suits bulk material processing and production applications where high-volume material throughput is required and upstream/downstream equipment configurations dictate drop-in-type valve profile. Standard 8-vane rotor design with beveled tips and sides promotes process efficiency by providing correct inlet/outlet sealing. Cast iron or 304 or 316 stainless steel valves are offered with 4 flange diameters from 6–12 in. and 4 heights from 12–25 in. CALEDONIA, Ontario, Canada – ACS Valves. ACS Valves announcesthe CDC-CI Series of rotary valves designed specifically for those particular bulk material processing and production applications where very high-volume material throughput is required; and where upstream and downstream equipment configurations dictate a drop-in-type valve profile. To enable this high-volume material throughput, the ACS Valves CDC-CI Series rotary valve features anenlarged housing barrel. The CDC-CI barrel is cast wider and taller within its valve housing profile than are the barrels of conventional rotary valves. The large barrel-to-housing proportion, within the industry-standard housing profile of the CDC-CI rotary valve, ensures the dimensions of the CDC-CI Series housing profileremain consistent with industry-standard dimensions for valve housings. The CDC-CI Series fast and easy drop-in replacement design, together with its high-volume material throughput, make this rotary valve a flagship product in the ACS Valves Pre-fit Performance® Series of rotary valves. The CDC-CI standard, 8-vane rotor design, complete with beveled tips and sides, contributes to total process efficiency by providing correct inlet and outlet sealing and, therefore, maintaining proper pressure differentials upstream and downstream of the CDC-CI Series valve, while also reducing compressed air requirements. The CDC-CI Series valve housings are cast in North America to ensure superior strength in the composition and solidification of the housing's metallurgy; and to eliminate dimples, crevices, and pits in the housing's product contact,and non-contact surfaces. The CDC-CI Series housings are CNC-machined to precise tolerances; eliminating axial shaft movement, seal leakage, and shortened bearing life. 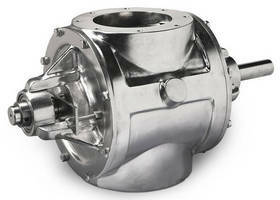 The CDC-CI Series rotary valves are available in cast iron, or 304 or 316 stainless steel. The CDC-CI Series is available in (4) flange diameters from 6 inches to 12 inches; and (4) heights from 12 inches to 25 inches. TheCDC-CI rotary valve series is available with an optional 6-vane, 10-vane, or 12-vane rotor; and with adjustable rotor tip options of EPDM rubber, polyurethane, hardened steel, stainless steel, or bronze. The ACS Valves CDC-CI Series offers the ACST-4 glandless Teflon® shaft seal, to provide a micro-tolerance, self-lubricating sealto the rotor shaft; extending duty cycles, eliminating leaking and the need for seal adjustments. The ACS ValvesCDC-CI Series is available with direct-drive or custom drive packages, as well as application-specific accessories, including:a blow-through adapter, shear plate deflector, surge hopper, or motion speed switch assembly.